Teak is an amazing wood. Althought here in the U.S, is not used for strcutural applications, its strenght values are similar to our native Oaks. Teak seasons well, is rated as very durable in respect to decay and insect resistance, and is somewhat hard to finish with oils and paints. The Teak heartwood varies from a yellow-brown to a deep brown with streaks of dark color. It is amazingly stable with a very low shrinkage factor. Although teak comes originally from countries in the West Indian Ocean, but there's been development of plantations in South America and Africa. 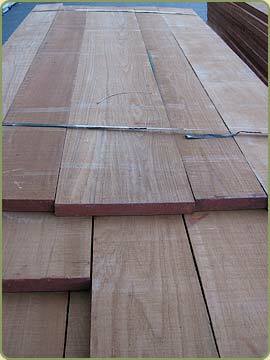 Above: Several rough cut slabs of Burma Teak FAS Grade ready to be shipped. Janka side hardness: 1,000 to 1,155 lb for dry material. 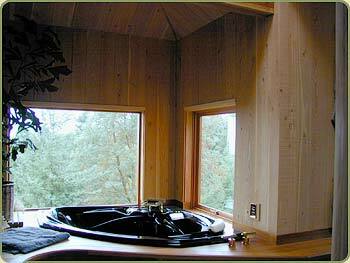 Forest Products Laboratory toughness: 116 in.-lb average for green and dry wood (5/8-in. specimen). Finishing: Heartwood extremely resistant to preservative treatments, sapwood also of low permeability. Workability: Easily worked with both hand and machine tools and dresses to a very smooth finish if tools are kept sharp; glues moderately well despite its oily nature. Blunting of cutters can be rather severe. As noted, may cause dermatitis on some individuals.